Yoga addicts have taken over Nosara, a wild beach surrounded by tropical forest. Come and recharge your batteries in an eco-lodge nestled between the jungle and the ocean. The Nicoya peninsula, on the Pacific coast of northern Costa Rica, is a very special region and one of just five Blue Zones, regions of the world where inhabitants live longer and enjoy better health and well-being. 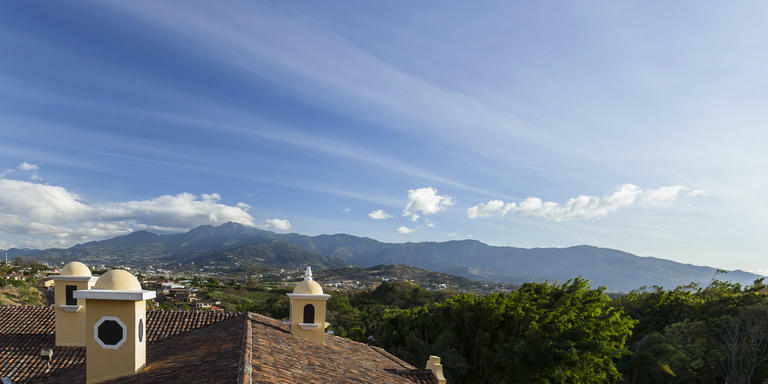 From San José, take a short flight and experience this exceptional quality of life for yourself. You arrive in Nosara with a burning desire to switch off and get closer to its luxuriant nature. Live the pura vida just like the locals; it is a common greeting, but also a way of life that celebrates happiness. Leave your stresses behind in a village that holds on tightly to its chilled-out atmosphere. It will not be long before you take your first dip in the ocean. Nosara nestles amidst thick vegetation. A path shrouded by jungle opens out onto a vast beach. There is no construction around to defile the wild beauty of the place. Bare-foot in the warm sand, you can feel the power of the elements working their magic as the perfect anti-stress relief. As the surfing capital of Costa Rica, Nosara attracts surfers from all over the world who come here to take on its incredible waves. Nosara is also well-known for its well-being retreats. The ocean and peaceful jungle setting provide the perfect backdrop to practise yoga. If you are looking for somewhere basking amidst pristine nature, where you can both rest and stimulate your body, then climb up to the top of the village. The Lagarta Lodge is an eco-friendly hotel in perfect harmony with its surroundings. And its views will take your breath away: two rivers meander through the tropical forest and flow out onto the virgin beaches of the Pacific. The sight of its two pools will send you into raptures, their sensual curves set magically between the rocky cliff and luxuriant gardens. It is a dream setting to relax, meditate and be pampered. Settle in to your room surrounded by the sprawling trees of the forest. You will love the choice of tropical colours which blend discreetly with the decor of the lodge. Driftwood furniture, paintings of colourful landscapes, papier mâché sculptures… Contemporary works created from natural materials by American and European artists give the interior its signature touch. Everywhere, art and design, sophisticated architecture and natural environment interact harmoniously together. Marta Araya and Martin Knecht operate the hotel according to ethical, ecological and aesthetic principles. 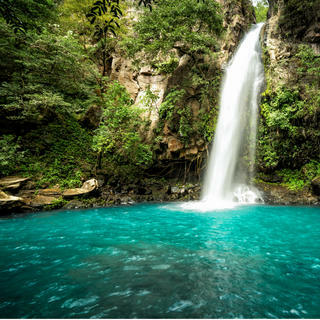 By staying here, you are also supporting local educational and environmental projects in Costa Rica. This exemplary philosophy means that you can focus on yourself with a clear conscience. Nestled into the cliff, the spa at Lagarta Lodge opens the doors to inner peace. A yoga instructor invites you to follow the method best suited to your personality and level of experience. If you want to learn a gentler method, Hatha yoga will help you relax, focus your concentration and restore your energy levels. For a more energetic session, choose the Vinyasa method, comprising classic postures and breathing exercises. The frequent changes of position really enhance the feel-good factor. Or maybe you would like to try aerial yoga. Combining traditional yoga postures, Pilates and the use of a hammock, this technique helps reduce stress and boost your physical abilities. So, what are you waiting for? Feel at one with the world as you gaze out over mangroves and giant trees. When you come out of this uplifting session, drift up to the lodge's Gecko Lounge and sip a papaya smoothie as you let your mind float out to sea. Later on, a guide will take you on a tour of the hotel's own private nature reserve. As you stroll along marked paths, between tropical forest and mangroves, howler monkeys, multi-coloured birds and timid anteaters peer furtively out of the vegetation. Your exploration continues by kayak on the Nosara River where you may even come across a harmless caiman or two. Wonder-struck by this unique biodiversity, you then go to Playa Pelada, a picture-postcard kind of a beach. Head to the terrace of La Luna with its uncluttered decor and chill-out atmosphere. Make sure you reserve a table in this low-key beach-front restaurant. Relax on a sofa, rocked by the sound of the waves, as you enjoy a cocktail, in moderation of course! The red glowing sun dips gently towards the horizon. The waiter serves your ceviche, a dish of raw fish marinated in lemon or lime juice, and a seafood stew with coconut milk. And maybe, if it is your lucky day, local children will come running up the beach in the half-light to tell you that sea turtles are hatching a few metres away.